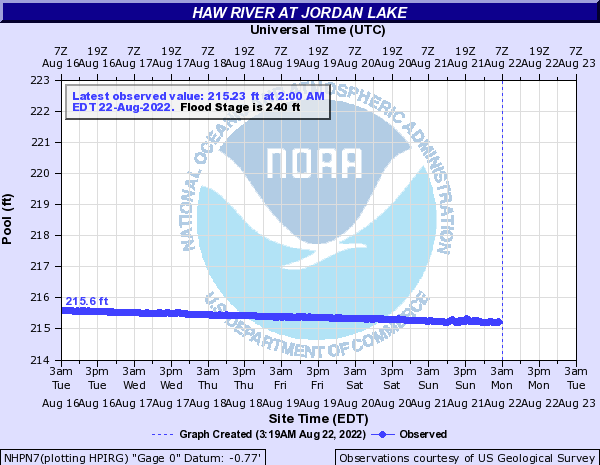 Click on a chart for more information from the sites at the National Weather Service and the U.S. Geological Survey. If you would like to be informed of river level changes via SMS text or email, you can set up a USGS WaterAlert Subscription. 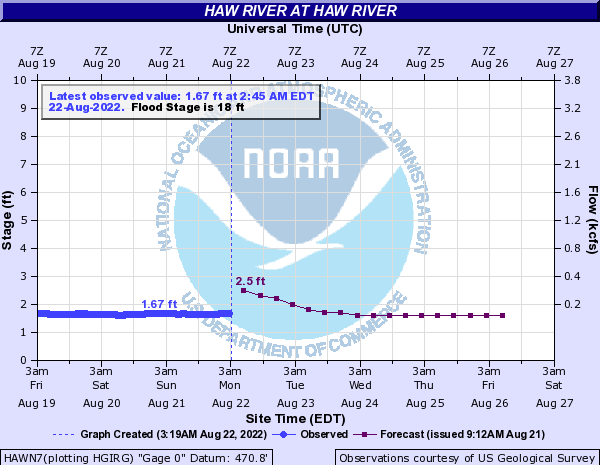 What do the numbers mean for the Haw River? The information below is from a local kayaker. It used to be that you would have to drive to the river to see what the water level was at any given time. There would be painted hash marks on a bridge column somewhere along a river, giving its height in feet and inches. Along with technology came the USGS water data gauges which are a great tool for seeing what a river is doing without having to get boots on the ground. 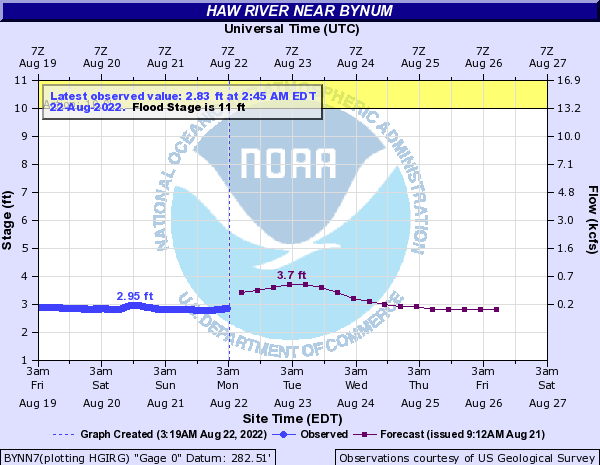 With that being said, gauges are not always a concrete indication of what a section of river will be like. For instance a gauge wouldn't read any of the water coming in from tributaries downriver of the gauge, localized heavy rain, often gauges freeze in the winter, or trees wrap around them changing their readings. Sometimes they have software problems and wrong info goes online. With the new USGS gauges the graphs shown are precipitation, gauge height in feet, and cfs (cubic feet per second). Older school boaters will relate more to the gauge height in feet, I have always found for myself that reading the volume of water in the river by cfs is more accurate to me. They should correlate. A section of river is never safe. All paddle sports are inherently risky. Rivers are very dynamic environments, that are constantly changing and are a relentless force. It is very important to research any stretch of river you are planning on running, and to be certain you have the required skills to safely navigate the stretch. There are dozens of guidebooks, FB groups, outfitters, and paddlers that are very willing to share information about the different Haw Stretches. Something that does make the Haw River a dangerous river is the amount of trees on its riverbanks and within the river itself. Trees create strainer and sweeper obstacles that paddlers can tangle themselves into, with the potential of getting wrapped up in one, and held under water. Lots of exposed rock, some carrying required in spots, channelized water, steep banks. River has water in it, multiple routes open, some debris becomes active, river is still within its banks, some trees come into play. River has moving water, debris is actively moving around. Trees are actively changing spots. Multiple routes and lines open in sections with rapids. Trees come into play as strainer considerably more near river banks. Whitewater specific gear highly advised, including paddling experience and rescue training. River is still within its banks. River starts to become a big volume run, with dynamic water. Large debris, water hydraulics, trees and swift water create numerous hazards. River is beginning to come out of its banks, whitewater specific gear only. Advanced paddling experience and rescue training is highly advised.